This is not quite an “Old Book Update” but it is a used book reminder! I first read this book when it was published in 1979, having known of Dr. Pickering for some time before. 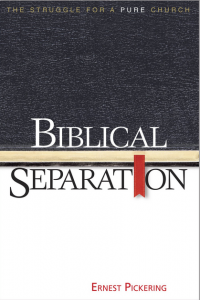 It was a timely book, coming before the 80’s and some struggles among churches over things like “secondary separation.” It is still a valuable book in defining terms and dealing with biblical passages. The sub-title, The Struggle for a Pure Church, is really the theme of the book. Pickering reviews the separatists throughout church history and the price they paid for their position on holiness. It also serves as a good text for clarifying 20th Century battles over modernism and ecumenicalism. Can We Separate From Brethren?